This must have been the most visited cafe I visited whilst I was in Gympie! Maybe four times? I have recently completed my work here in Gympie, working as a night owl and changing my circardian rhythm. Some days, after a busy shift, I will treat myself to good delicious treats and coffee from Emilia's, which is THE place to go! Emilia's is an Italian influenced cafe that serves breakfast, lunch and plenty of sweet desserts. The menu is up on their chalkboard on the wall. They do sell some imported rare Italian produced in the cafe that I have yet to try. Well, I have sampled at least one of their breakfast, lunch and dessert choices and I thoroughly enjoyed all of them. My housemate, Anne first visited this place and claimed how good their panini was! I had to try it and I had the 'chicken, fontina, dukkah, eggplant and sweet potato' panini. The serving was huge, filling and delicious. At $14.50, it was worth the deal! 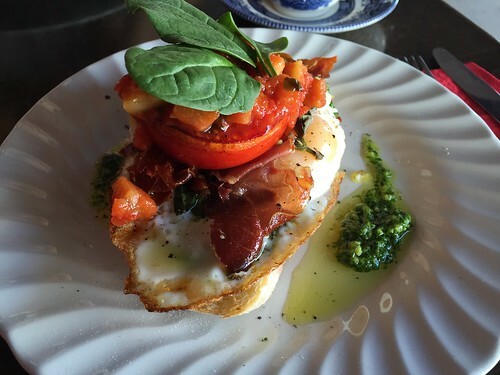 On other occasion, I tried one of their breakfast: 'fried egg with crispy prosciutto on toasted sourdough, with roasted tomato, tomato relish and pesto' with flat white. I am still thinking of this dish while writing up this blog. Simple and yet so moreish. 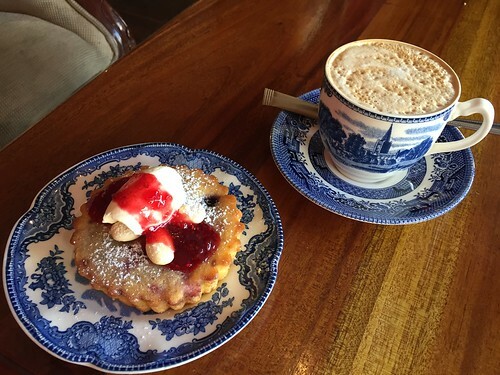 There is always room for dessert and for the next visit, I tried the blueberry tart. The lemon curd tart was so tempting but as it was alcoholic, I had to refrain from eating it before work. What a shame! PS I love the antique looking cup they used to serve the coffee.